An essential factor that all rare booksellers have in common is controlling costs. A significant portion of those costs are in shipping out books on a daily basis. We have long used the services of Endicia (www.endicia.com) to process and track our postage, both domestic and international. Anyone with a computer, printer, and the Internet can access it. After comparing the features of all the online postal services available (USPS, Stamps.com, Shipstream), we chose Endicia as our standard method for processing postage for shipping via US Postal Service or UPS. We ship in protective bubble mailer envelopes or boxes. We found Endicia to be more affordable and offers more features than the other services. A free 30 day trial is offered, with three levels of plans available, priced from $9.95 for the standard service to $34.95 for the premium service per month, and designed to fit the various shipping needs of PC and Macintosh users. A creative new service called PictureItPostage now offers the ability to order custom stamps with your own image or graphic. The software that is used for ordering, printing, and tracking postage is DAZzle. DAZzle, a downloadable software, allows you to track your postage costs, verify addresses, customize labels, print shipping labels in bulk, offers free delivery confirmation of orders, and the ability to import shipping addresses from various formats. The process involves entering a mailing address, validation of the address, and printing of postage. 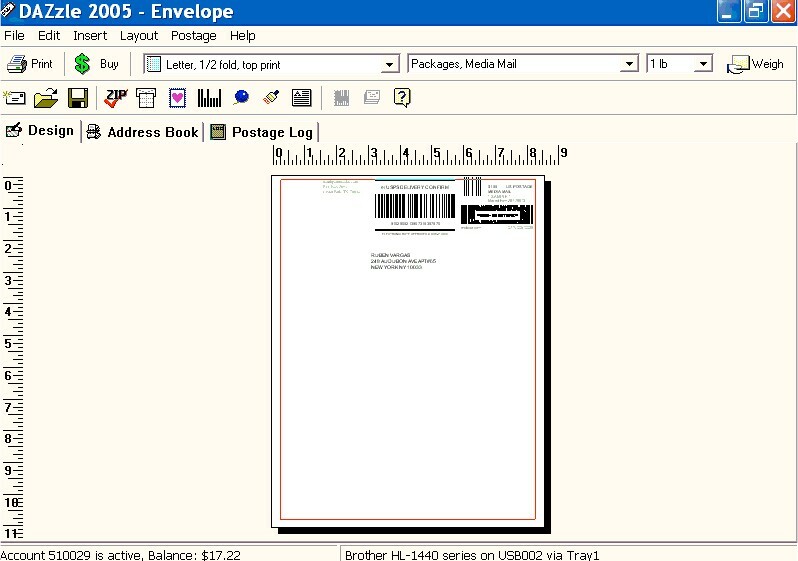 The USPS requires that an address be verified prior to the postage being printed, which is a built-in feature of DAZzle. You pay the face value for the amount of postage to be used in increments, and packages have to be shipped on the date that the postage is printed. For any errors in printing (for example, if your printer runs out of toner when printing), you can receive a refund within a 30 day period. The software can import data from various sources, including Microsoft Outlook, Office, ACT!, Goldminer, Maximizer, CSV, and tab delimited text files. A demo of DAZzle is available for viewing at www.endicia.com/endicia-usa/Site/demo.cfm. An appropriate scale is needed to accurately weigh packages and determine the amount of postage needed to be purchased, which is calculated by the software. Depending on the capabilities of your printer, you can either print postage on mailing labels or directly onto an envelope. There are several sizes to choose from within the software, and you can also setup a custom label size. A laser printer has worked well for our purposes.